I had written yesterday that I would post the “New Beginnings” meditation that I used when I did my version of a house blessing for the condo I’m renting. I’ve decided to post that on another day. Instead, I will write about these gorgeous traditional Thai desserts that I saw in the mall. 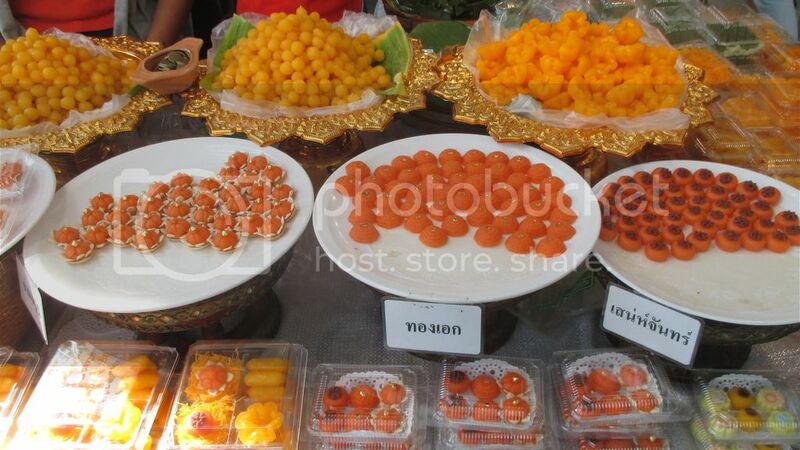 Thai desserts are known as Khanom Wan Thai (ของหวานไทย). I have to thank Migrationology.com for all the translations and descriptions below. Like when I wrote about Thai breakfast food, I’m not 100% sure that I’ve correctly identified the desserts, so forgive me for any mistakes. Regardless of the actual names though, everything looks so delicious, and impossibly hard to resist. 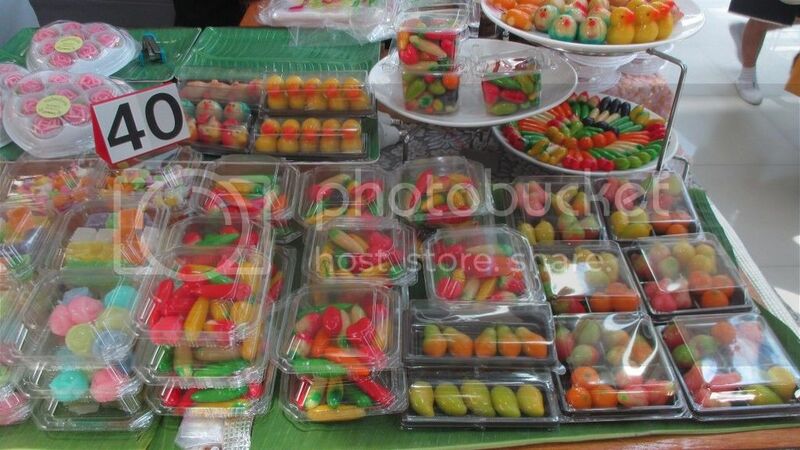 The first desserts that caught my attention were these sweets below that I think are Tong Yip (ทองหยิบ or Flower Egg Yolk Tart), or some variation of it. Tong Yip is egg yolk, sugar, and flower water boiled in sugar syrup and formed into flower like shapes, and the ones below are a bright orange color. Also very brightly colored, this time in pink, is what I think is either Woon or Taptim Grob. Woon is Thai for jelly (วุ้น), and Taptim Grob is Water Chestnuts in Coconut Soup (ทับทิมกรอบ). It might be a combination of both. 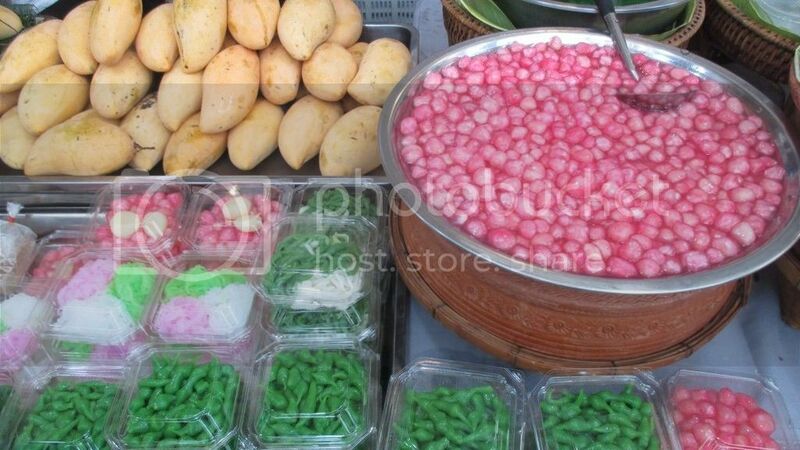 The pink, green, and white glass dessert below the mangoes are Salim (ซาหลิ่ม or Glass Noodles in Sweet Coconut Milk), and what looks like shiny green beans at the bottom of the photo are I think Look Choop (ลูกชุบ or Mung Bean Candy), which is made of smashed and sweetened mung bean paste formed to look like fruit and glazed in sweet candy. Below are more examples of very cute Look Choop. 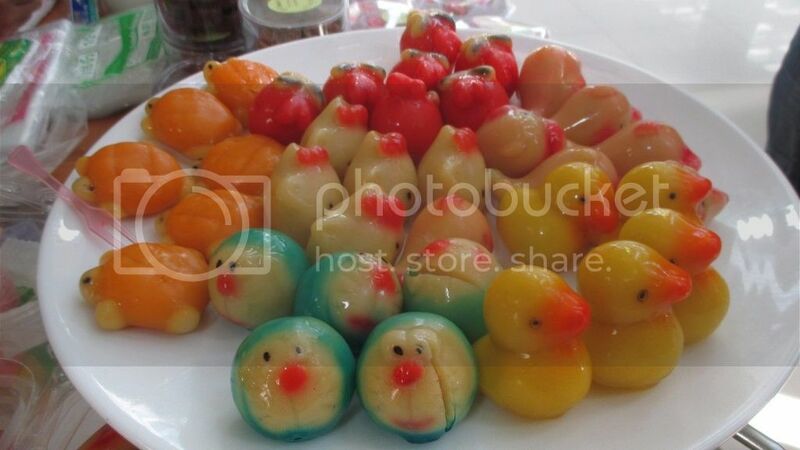 Aside from fruits, there are some that are shaped like turtles, ducks, Hello Kitty, and even Doraemon! I wanted to buy the Doraemon ones, but I decided against it because wouldn’t be able to eat them anyway. They look too cute to eat, and besides – eating Doraemon is just wrong. 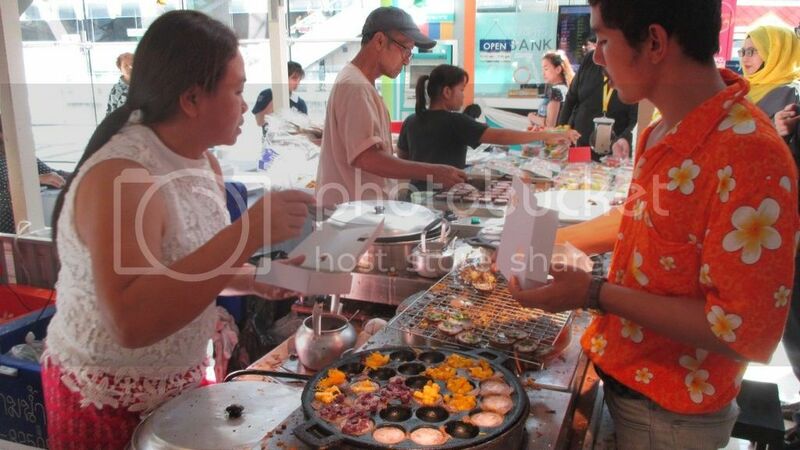 Below is I think Khanom Krok (ขนมครก or Coconut Rice Dumplings). These traditional coconut and rice flour dumplings are cooked into little kettle cakes and often topped with a choice of green onions, sweet corn, taro, and other items or just plain. Barely visible in the upper left of the photo below is Takoh (ตะโก้ or Coconut Cream Jelly). Tapioca flour is mixed with heavy coconut cream, coconut pulp, and sugar, and the mixture is steamed to create an intense coconut custard. 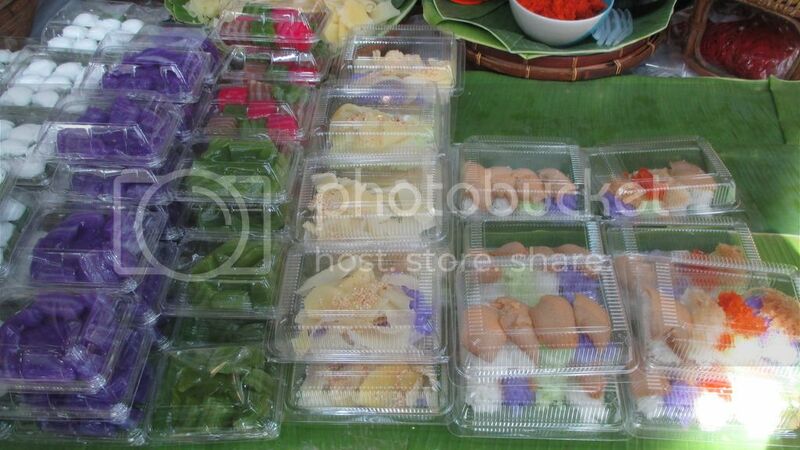 The purple and green desserts below the Takoh is Khanom Chun (ขนมชั้น or Thai Jello), which is sugar, coconut milk, and flour mixed and set in a cookie pan to firm and harden. 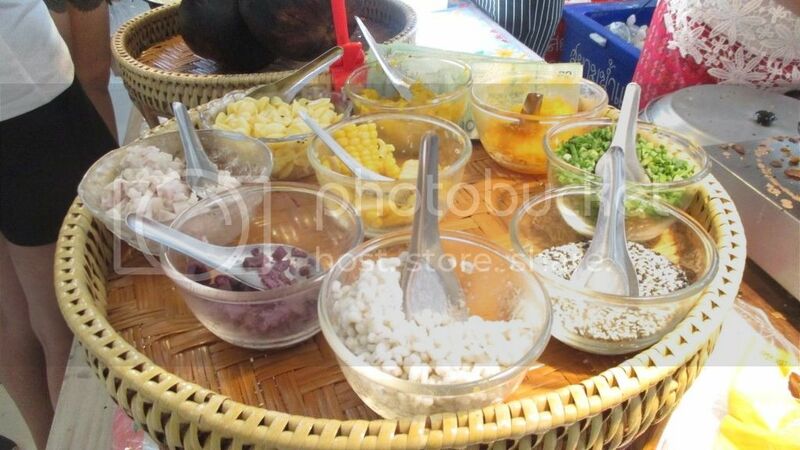 The desserts on the right are Khao Neow Moon (ข้าวเหนียวมูน or Colored Sticky Rice) with various toppings. 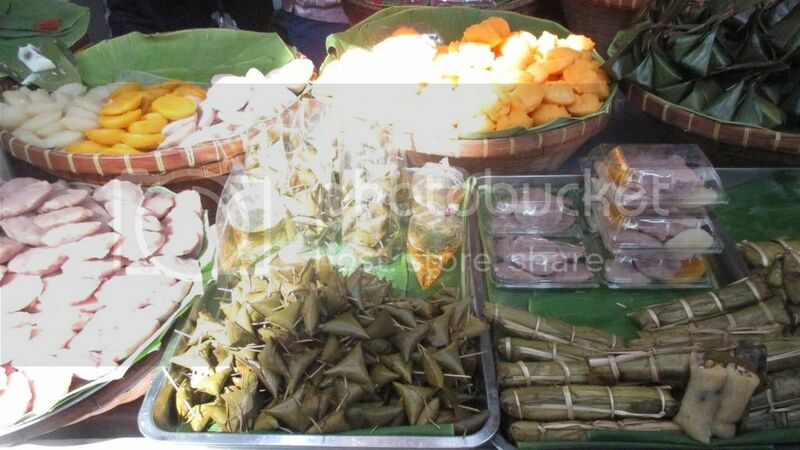 Next we have what I think is Khao Tom Mud (ข้าวต้มมัด or Banana Leaf Sticky Rice) on the right of the picture below. 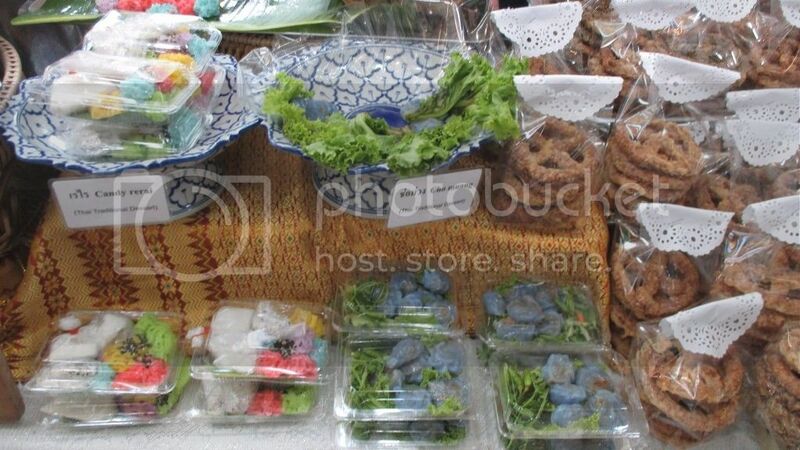 To the left of that is Khanom Gluay (ขนมกล้วย or Banana Treat) which is sticky rice, bananas, sugar and shredded coconut made into a green treat, and in the top left is I think Khanom Thien (ขนมเทียน or Sticky Cake), which is tapioca flour and peanuts made into a wet cake and wrapped in a banana leaf. 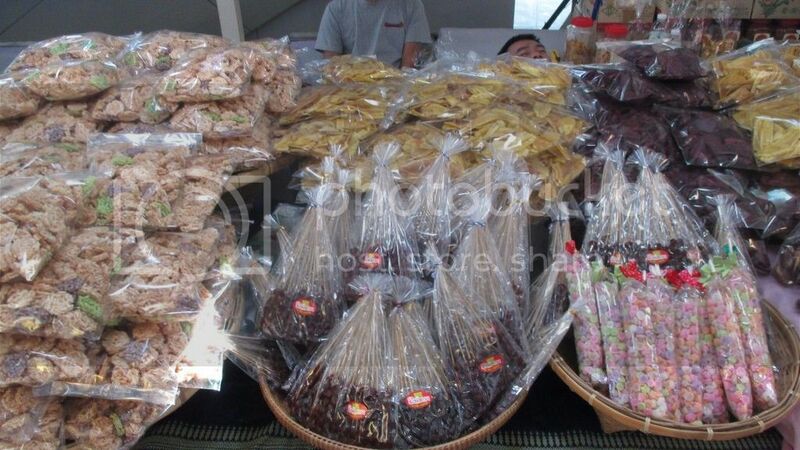 In the middle of the photo below is I think Putsa Cheum (พุทราเชื่อม or Candied Chinese Date), and above them are thinly sliced Gluay Kaek (กล้วยแขก or Fried Sweet Bananas). The other packets have various other dried fruits. 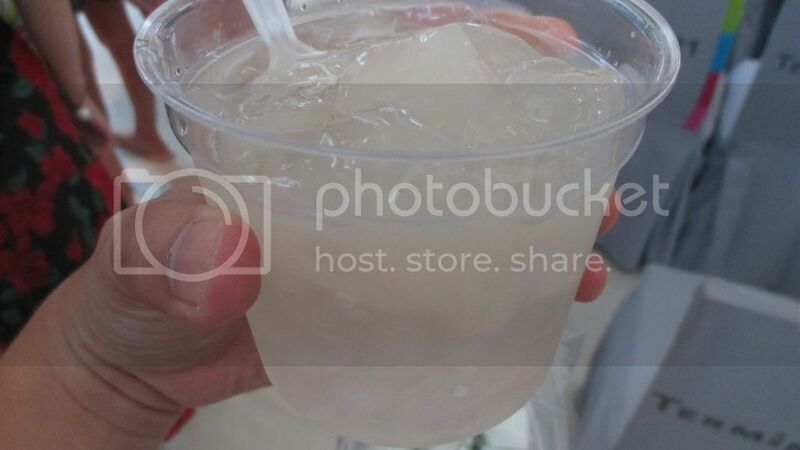 To drink, I had Wun MaProaw On (วุ้นมะพร้าวอ่อน or Iced Coconut Jelly). It’s something in between kaong and nata de coco but thickly sliced. 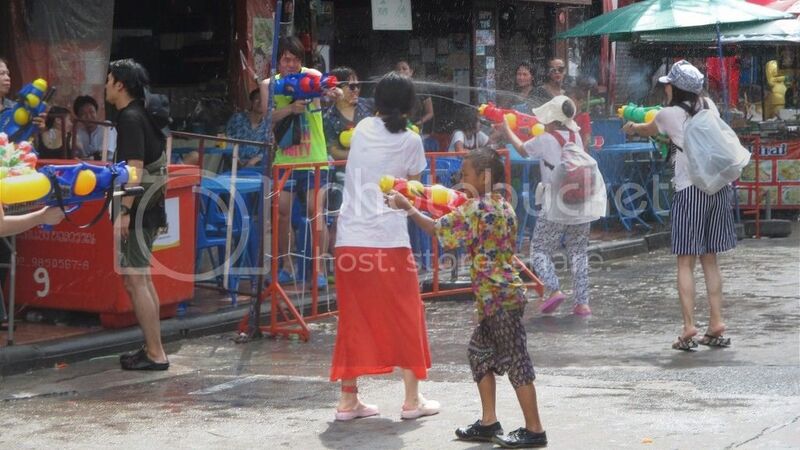 And finally these are Candy Rerai and Cho Muang. They look like dessert dimsun, but I’m not really sure because they’re not on Migrationology.com. Next to them is something that looks like pretzels. So I haven’t actually tried most of the desserts above. I only bought the Takoh and Wun MaProaw On because I really, really LOVE coconut jelly. I’m super proud of myself for resisting buying everything else I saw. I’m not so sure though that I’m going to be able to resist again the next time I pass by the dessert stalls. Oh well. 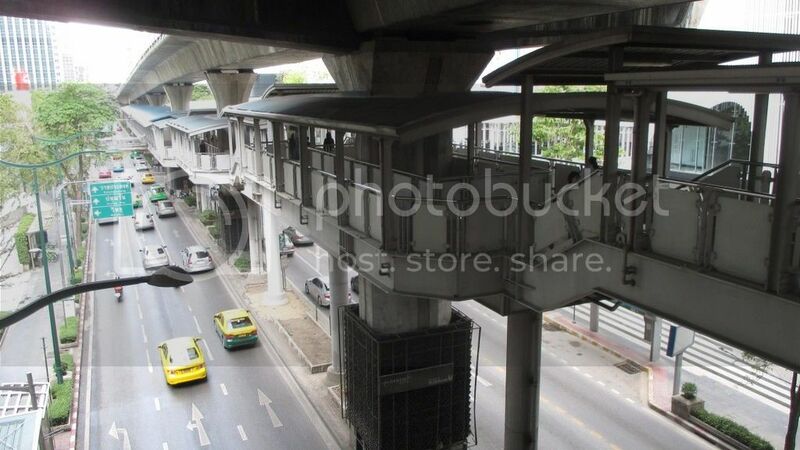 Yesterday I wrote a quick guide for the BTS Skytrain, the light rail system that is elevated above Bangkok’s streets. 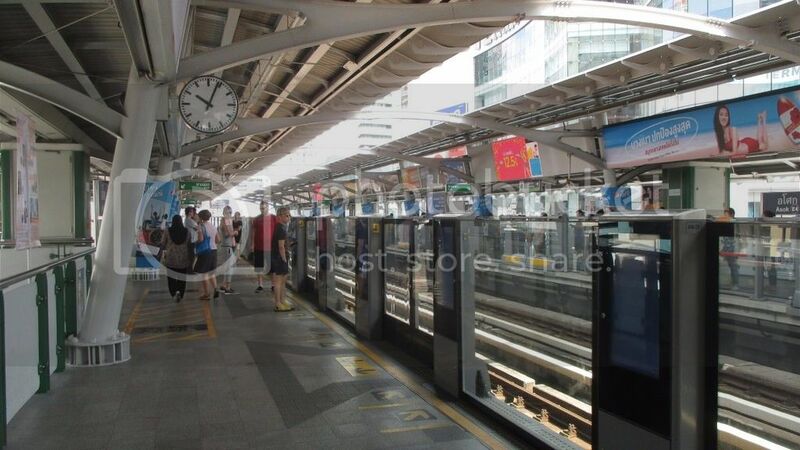 Today I’ll write a quick guide for the Bangkok MRT which is the city’s subway system. 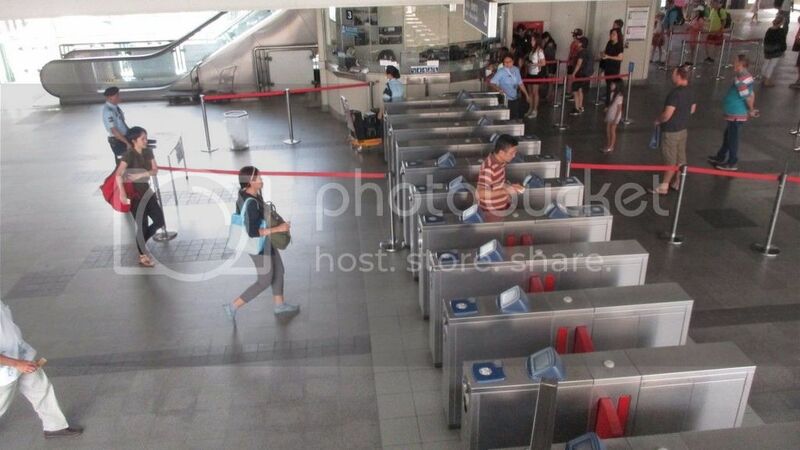 The BTS and the MRT intersect at a few stations. 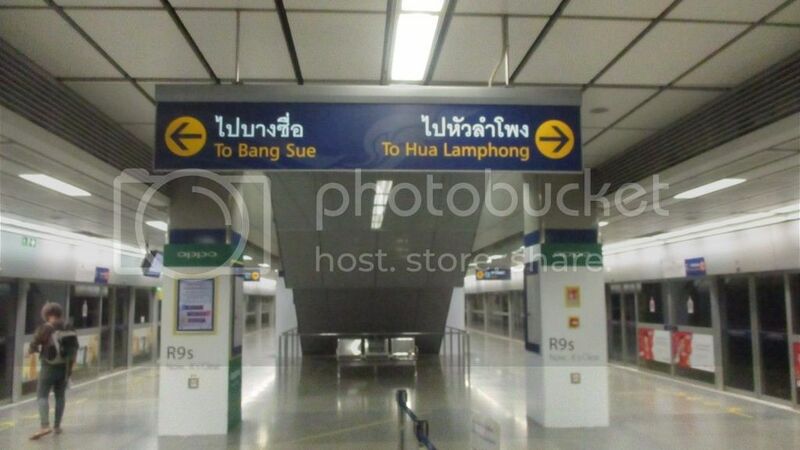 Below is a pic of the interchange between the BTS Asoke station and the MRT Sukhumvit station. 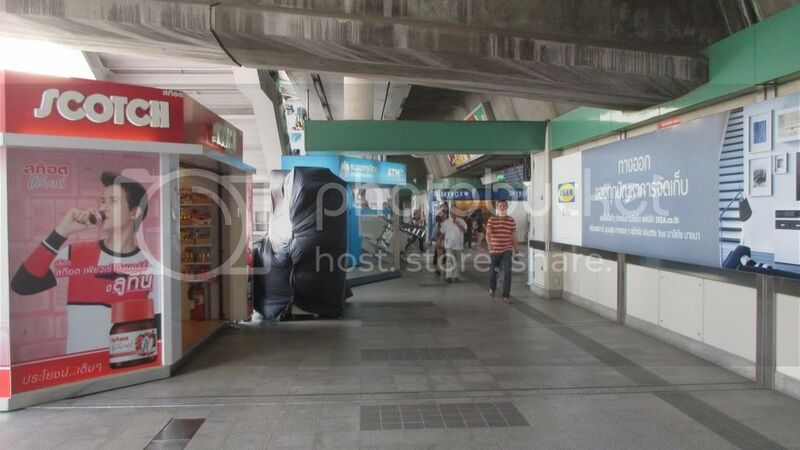 The entrance to the MRT is to the right of the blue roof behind the stairs leading up to the BTS. 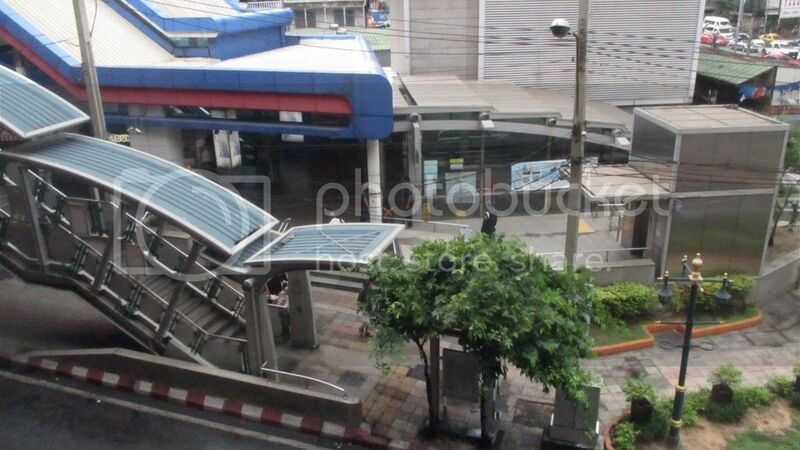 Below is the entrance of the MRT Sukhumvit station. Here’s the escalator going to the lower platform where the ticket vending machines are. There aren’t a lot of shops in the MRT station, but you will see a few ATMs. Some of the stations are connected to the Metro Mall, and other malls as well. 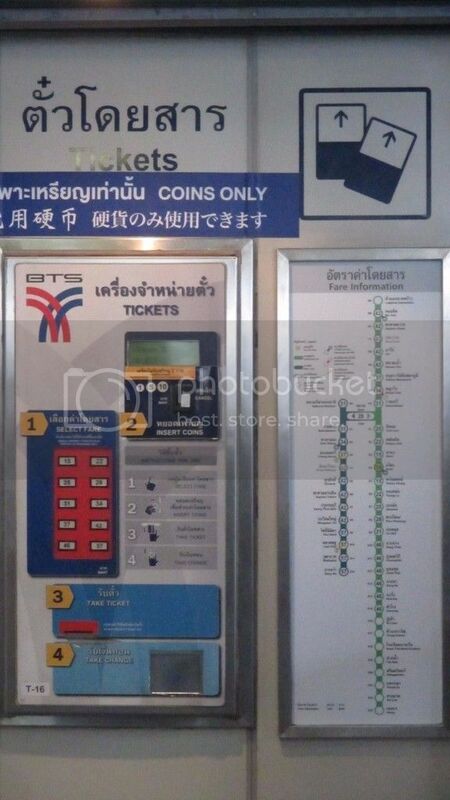 Like the BTS, you have the choice of getting your ticket from the ticket booth or from a ticket vending machine. The lines for both seem to be about the same, though there are more vending machines than booths. 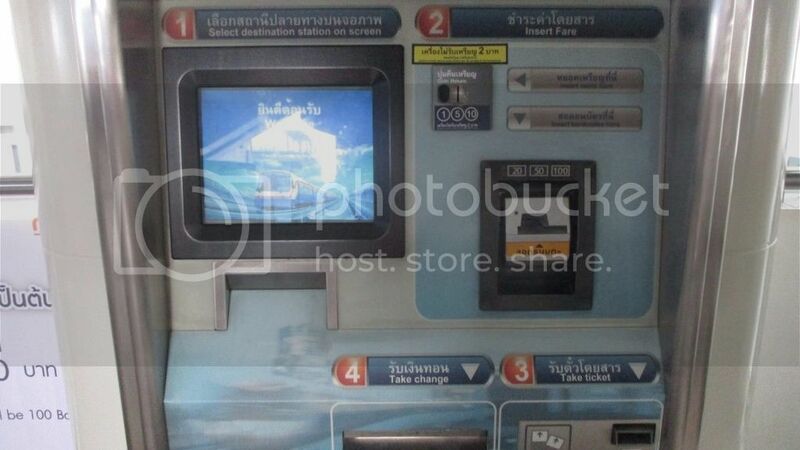 The ticket vending machine is easy to use. You select your destination station in #1, you insert your payment in #2, and get your ticket and change in #3. The single-journey ticket is actually like a medium-sized plastic coin. It has an electronic chip in it that contains your fare. Once you have your ticket/plastic coin, you go through the station gates and proceed to trains which are 1 level lower. 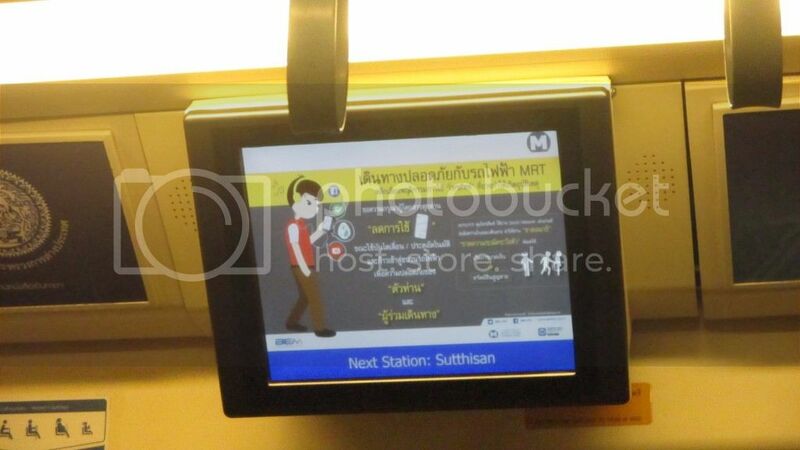 The signboards will let you know which side your train will be on. It helps to know what the end station is, though there are station maps posted everywhere. The platforms are very clean, and I think all of the stations have a protective barrier between the platform and the trains. The subway trains are packed on weekdays. Here is what it looks like early on a weekend though. Inside the train there is also a video screen that shows advertisements. It also let’s you know what station you’re at and what station is next. Once you arrive at your station, you get off and go up 1 level to the ticket platform. 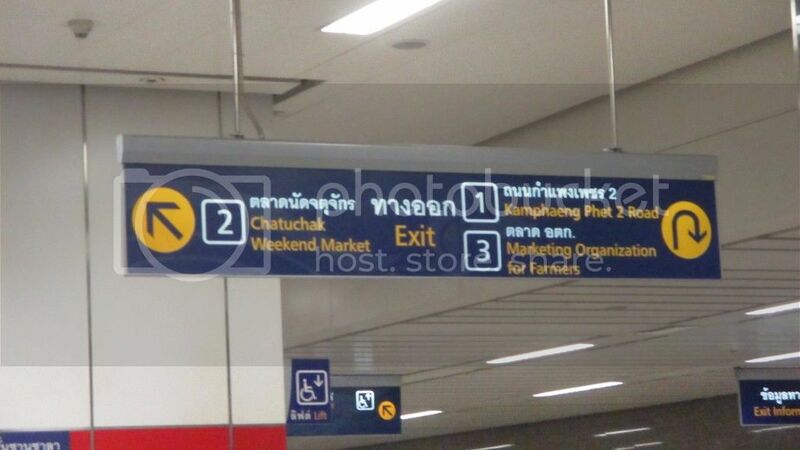 The signboards will let you know which exit to take depending on where you want to go. The exits will be another level up. Manila needs subways. We need more mass transit systems in general. I really look forward to having more trains in the Philippines. It would be awesome to be able to travel across Luzon in trains as pretty as these ones in Bangkok. 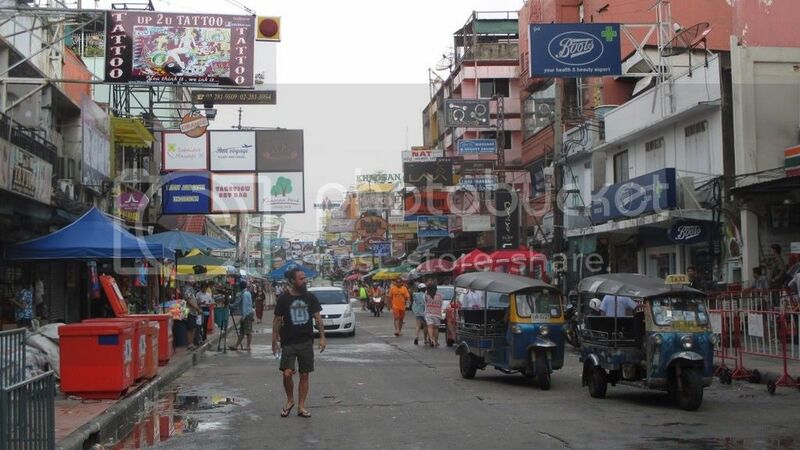 Traffic in Bangkok can get pretty bad. Sometimes I’ll wake up at 6am and there are already many, many vehicles on the road. Luckily for me, my hotel, the office, and my new apartment are all near the BTS Skytrain, so the traffic doesn’t really bother me. 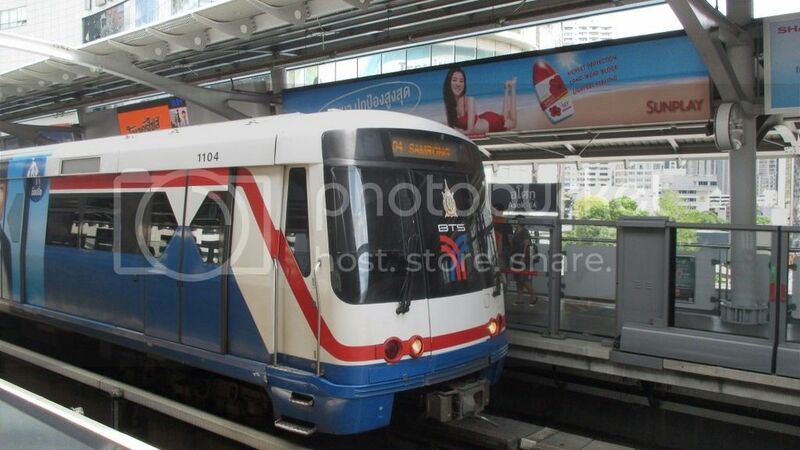 Bangkok’s light rail system is very easy to use. 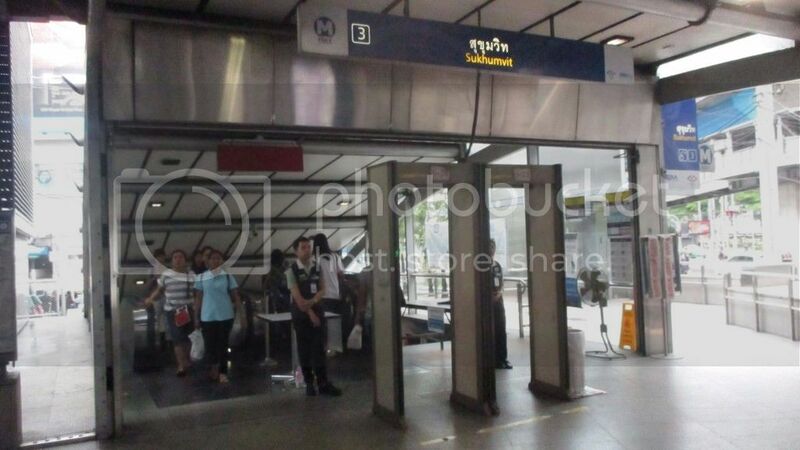 It comprises both the BTS Skytrain and the Bangkok MRT. 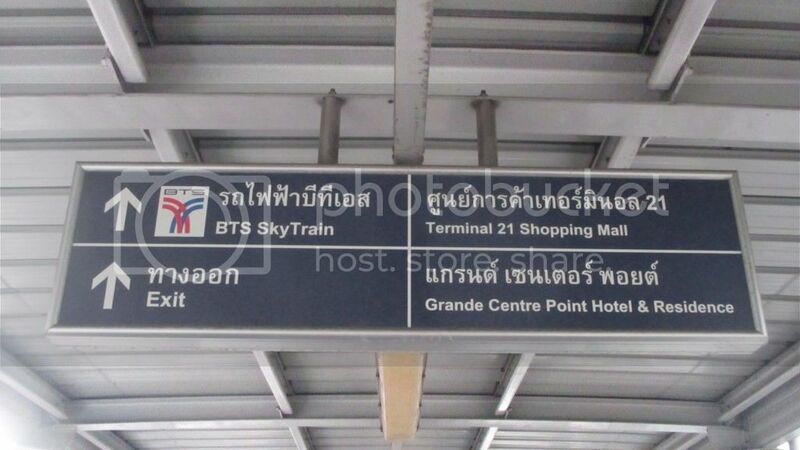 I use the BTS Skytrain everyday to get to work from the hotel. Once I move to my new apartment though, I’m planning to walk home instead. I need whatever exercise I can get, to be honest. Below is a map of Bangkok’s mass transit system. Not all places in the city have access to a train station. 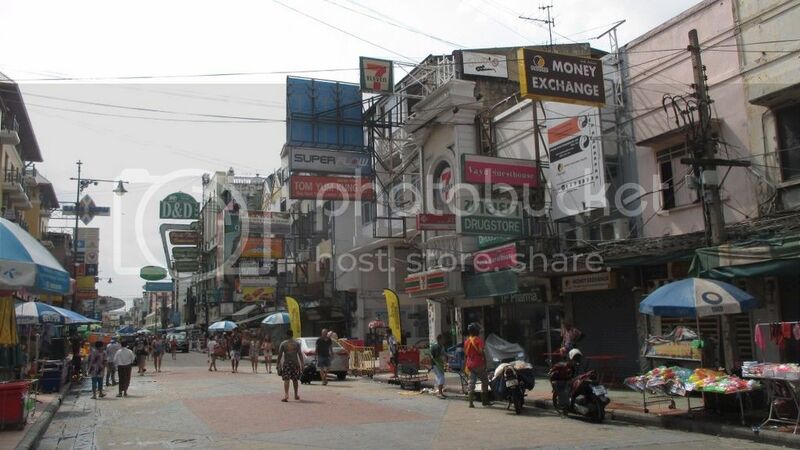 As an example, the tourist spots of Wat Pho, Wat Arun, and the Grand Temple aren’t easily accessible by train. Plans are in place though to increase the number of lines and extend some of the existing ones. 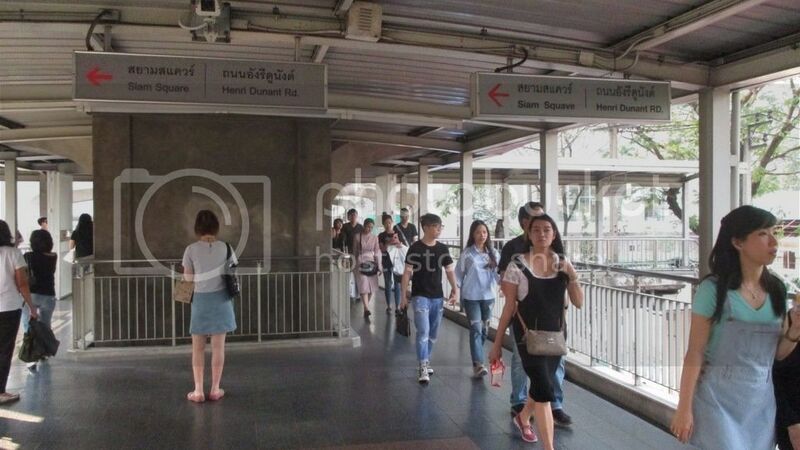 Here’s quick guide on using the BTS Skytrain. 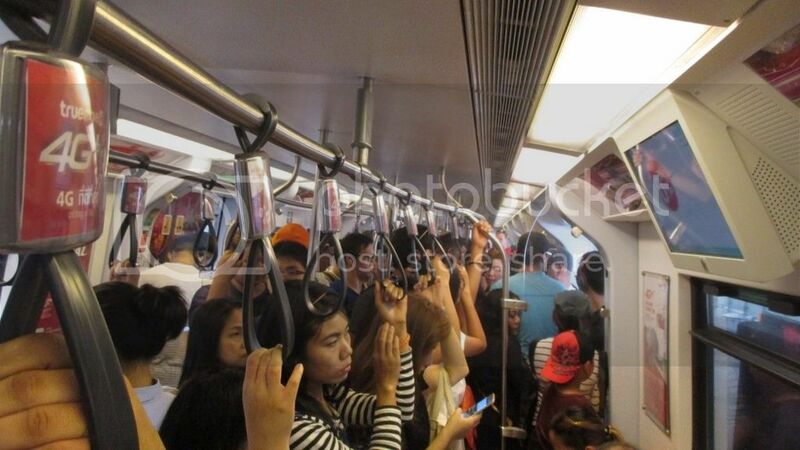 I’ll write about using the Bangkok MRT in another post. The main difference between the 2 though is that the BTS Skytrain is elevated above ground and the Bangkok MRT is a subway system. When you get to a BTS station, you have the option to either get a ticket through one of the vending machines, or through the ticket booth. I highly suggest you get your ticket through the vending machine, as the lines for the ticket booth are almost always as long as in the photo below. The booth is where you can buy the stored-value Rabbit card though, which is helpful if you’re planning to take multiple trips on the BTS. There are 2 types of ticket vending machines. The one below is the most common one, and it only accepts coins. It doesn’t accept 2-baht coins though, which is a bit annoying but understandable considering that the 1-baht and 2-baht coins are very similar in size. To use the machine, you first have to look at the Fare Information table which you see in the picture above on the right. Once you see the fare you need to pay to get to your destination, you press the button for that amount in #1. You then insert the coins in #2, your ticket comes out in #3, and whatever change you have comes out of #4. Make sure you select the right fare amount or you won’t be able to exit the station gates. There are a few ticket vending machines like the one below that also accept paper money. These are very easy to use as well, though the lines are a bit longer here. 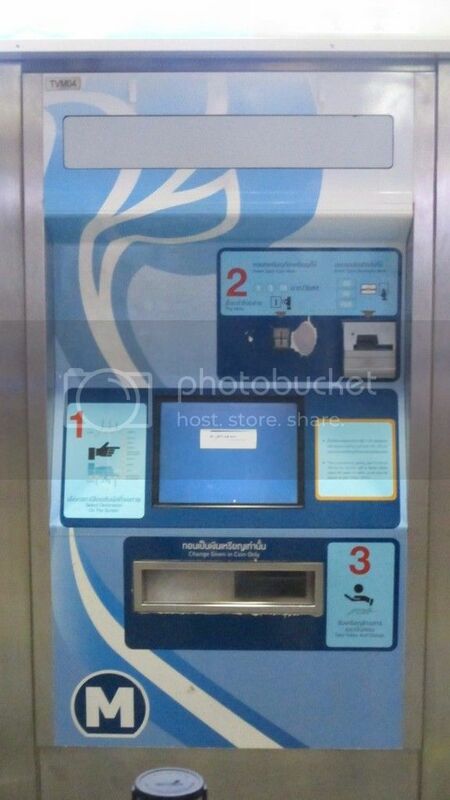 Like the other vending machine, this one also doesn’t accept 2-baht coins. 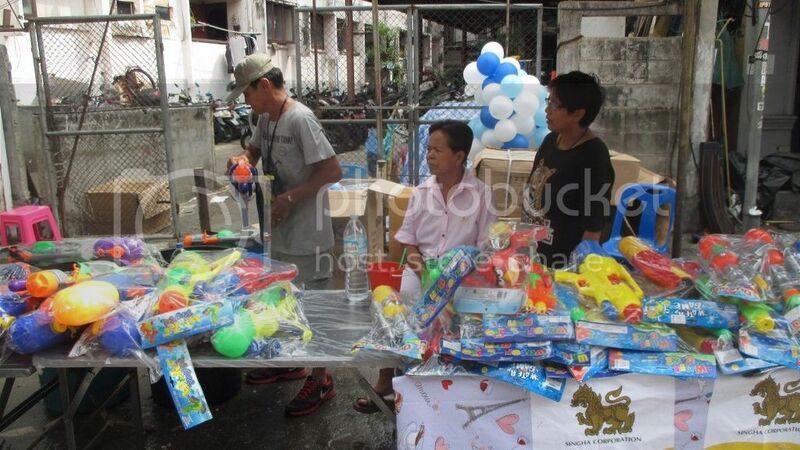 It accepts paper bills up to the 100-baht denomination. All you have to do is select your destination on the touch screen under #1, then insert your fare in #2. Once you’ve paid, you take the ticket that pops out in #3, and any change is dropped into the container in #4. Once you have your ticket, you proceed through the station gates. 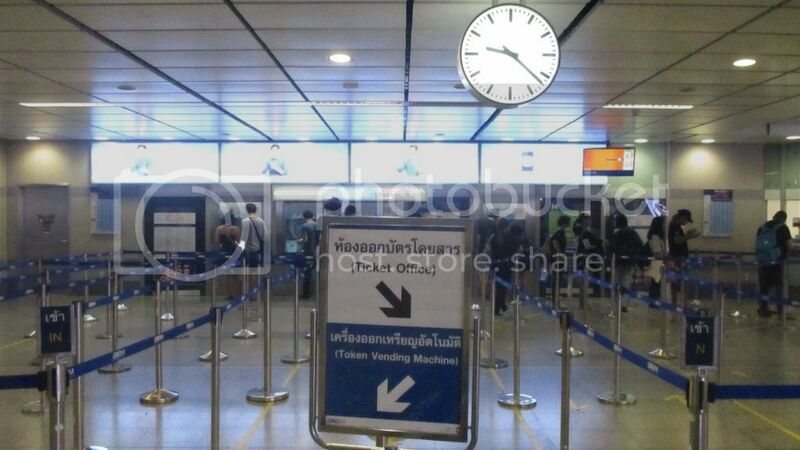 You tap your ticket on the blue square thing you see below, and the small monitor will show your ticket balance. Some turnstiles go both ways, so just check in case someone is trying to use the same gate as you. Inside the gates you can see some shops, and occasionally there are ATMs as well. Don’t linger too long though, as I think there’s a time limit on how long you can stay inside the station. Then you go up the escalators or stairs to the 3rd level. Once you reach the next level, you’ll see the train platform. Everyone is well-mannered and lines up. 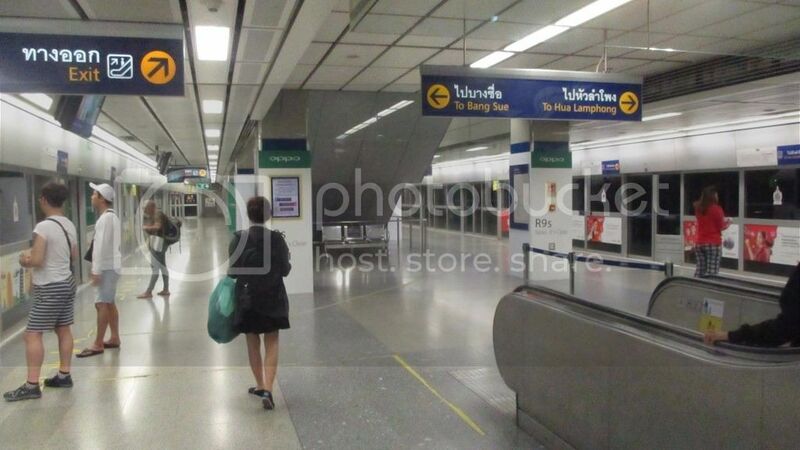 You have to be a bit careful as not all of the stations have platform gates like they have here in the BTS Asoke station. Here’s what the train looks like when it arrives at the station. People on the platform give way to people who are exiting the trains, and people on the train near the doors sometimes get off to make it easier for people in the middle to exit. 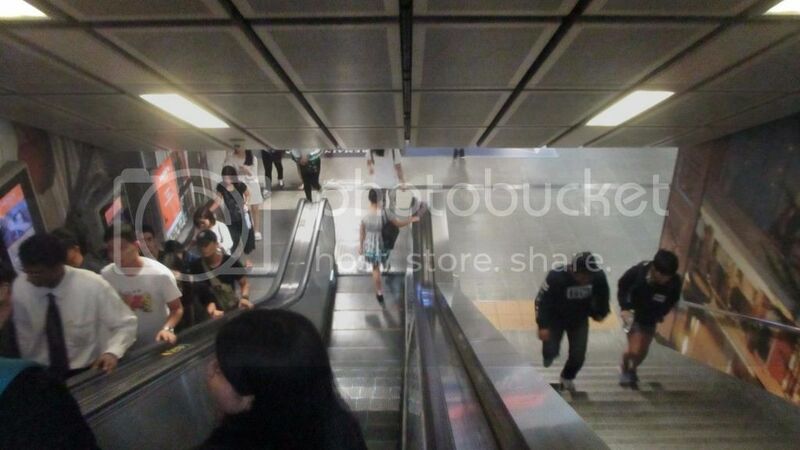 In Manila, I had to fight with disorderly people on the MRT almost everyday. I’ve never even come close to doing that here, even during rush hour. 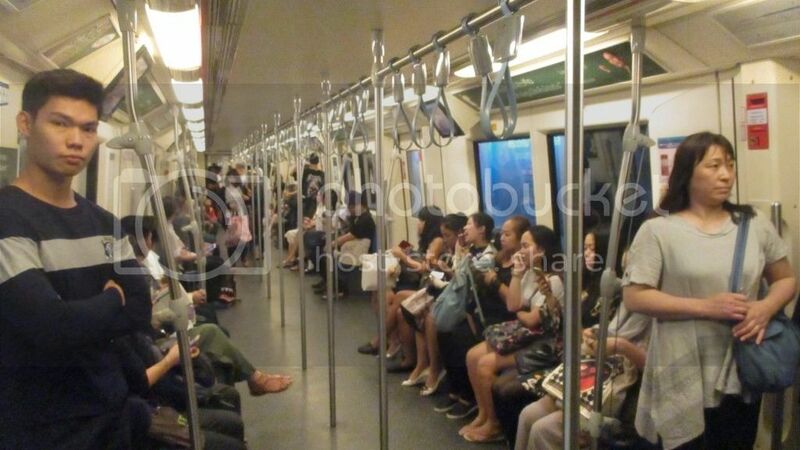 Here’s what it looks like inside the train on a Sunday. It can get even more crowded and packed on weekdays. Above the doors is a panel that shows you where the train is. 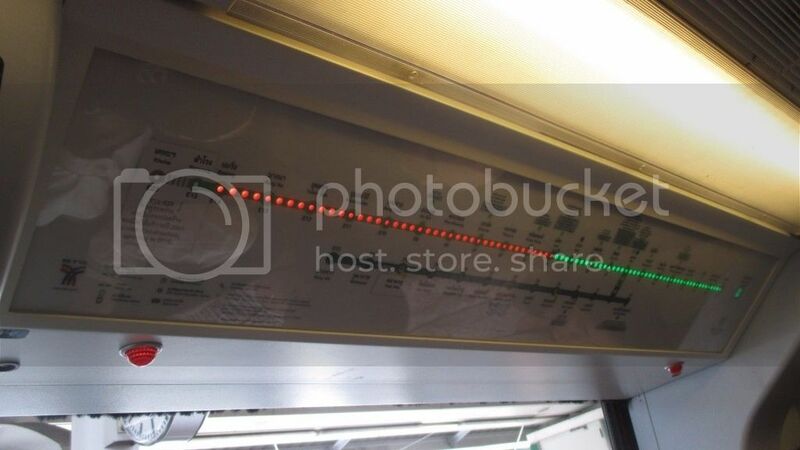 The red lights are the stations that have already passed, and the green lights show you the stations that are upcoming. Once you get off the train, you have to go down the stairs back to the 2nd level. Signboards let you know which exit you need to take for various buildings and landmarks. One of the things I love about the BTS is the Skywalk that connects some of the stations. The Skywalk is on the 2nd level next to the station entrances, and they are kind of like pedestrian overpasses only much cooler. 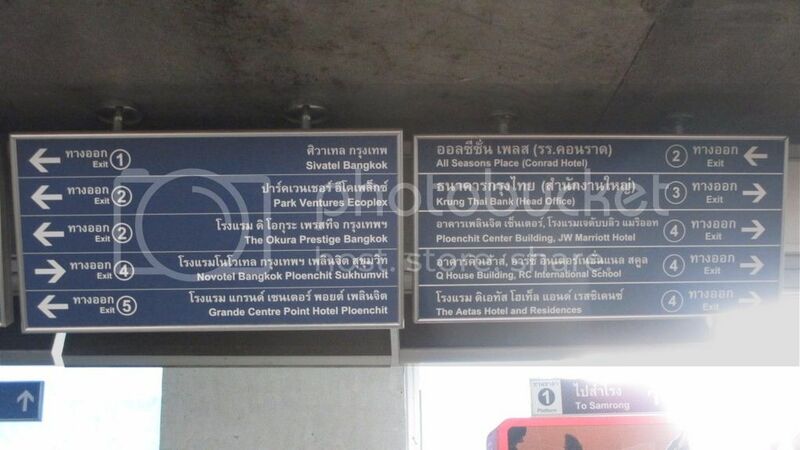 This section of the Skywalk goes from the Ploenchit station all the way to Siam station — 3 stations away! 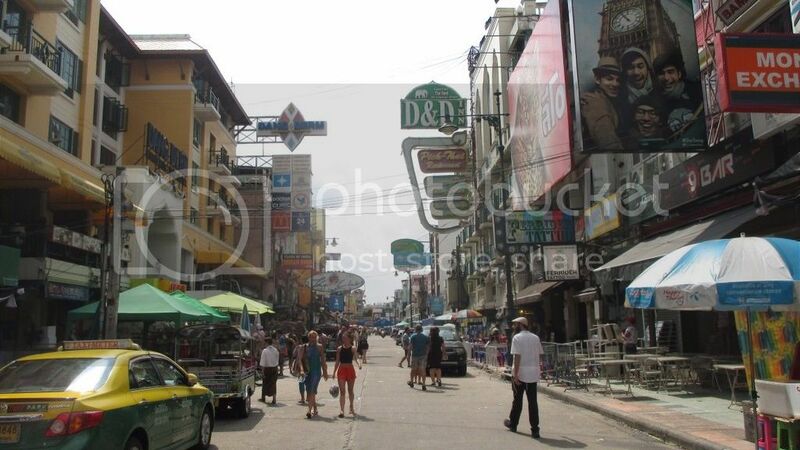 I love it because it encourages walking, and it’s not as hot as having to walk on the streets below. I really, really wish the new light rail lines they’re building in Manila would be more like this. 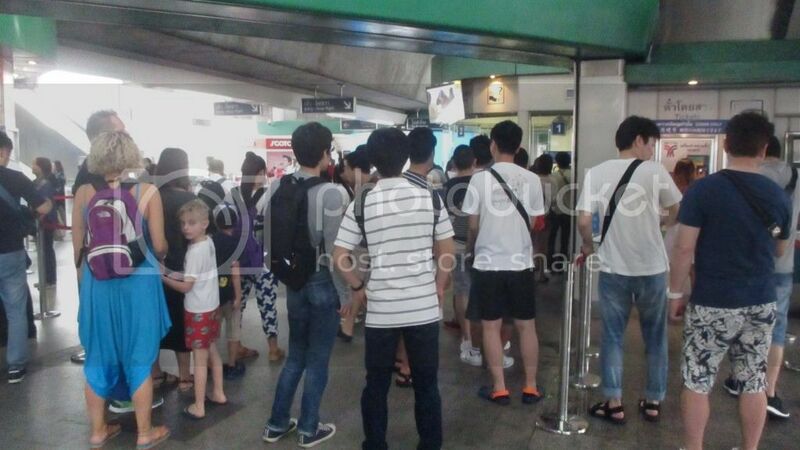 There’s no hope for Manila’s MRT, but hopefully the new lines will be better. There’s always hope, I guess.